Many of the Features Professionals Are Looking for! 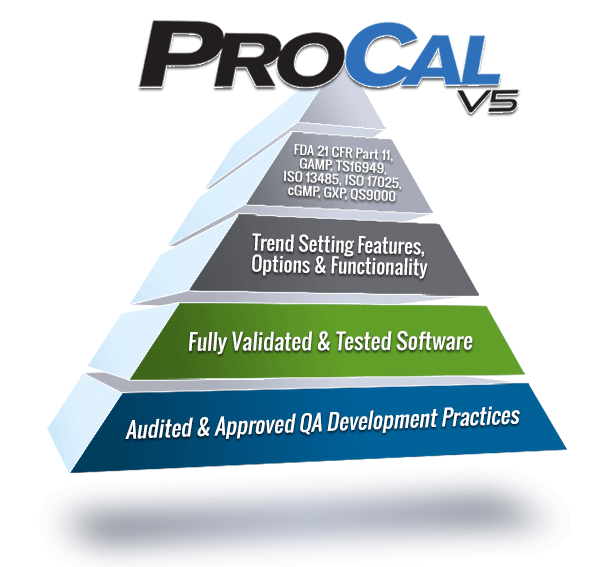 When it comes to feature rich calibration programs, ProCal Software shines at all levels of use. Whether for a single department or an entire enterprise, the features shown below, and there is many more, get the job done on time and with the compliance required. ProCalV5 has been specifically designed to provide the features necessary to satisfy the strictest of compliance requirements. These comprehensive control features support the compliant record management dictated for cGxP operations per 21 CFR Part 11, ISO 9000-2001, QS 9000, ISO 17025, ANSI 254 and others. With ProCalV5, record access is configurable, yet restricted to authorized users. The complete and easily viewed Audit Trail confirms record integrity. Password verification and forced entry of a modification reason are also available. This feature gives a recommendation on whether to decrease, increase, or maintain the current calibration frequency for any item record. It uses a specified number of Calibration records to make this analysis using the A3 method, given the target reliability and interval change confidence percentages. This is useful for optimizing efficiency of your calibration schedules. The report displays the Observed Reliability and Observed Out of Tolerance Rate for the most recent calibrations, using the space between the Calibration Dates to determine the Average and Longest observed intervals. Advanced Queries allow the user to intuitively search their ProCalV5 system for specific information they need. Advanced queries can be generated in all record types and allow the user to search for specific data. For example, you may search for all instruments in a specified location that are due for calibration within a specified date range. You may print the results of the query directly or export the query data to a disk destination of your choice. You may create, modify, and save multiple queries for repeated use, as well as delete queries you no longer use. You can select which fields to display, sort by, and find to quickly and easily find exactly the data you need. Test Type Package This test verifies the ability of Air Particle Counters to count particles of various sizes. Test Type Package for testing aspirated volume & recording K3 factor with a MAS-100C calibrator. Test Type Package designed to test aspirated volume & record K3 & K5 factor with a DA-100 calibrator. Test Type Package for testing differential pressure by looking up related flow value in table. ProCalV5 may be installed to meet the needs of even the smallest regulated user. The program is also available as a proven two-tier installation providing a high degree of user configurability, work saving options and tools for real time paperless field calibrations. ProCalV5 can also be deployed on Citrix or MS Terminal Server Thin-client environments. Thin-client architecture can provide significant savings on implementation and validation costs. User distribution is simplified without compromising performance or reliability. ProCalV5’s Archive Utility allows you to archive historical calibration and audit trail data according to a schedule you select. You may archive only calibrations or only audit trail information, or both. Reports are supplied to allow users to view previously Archived information. You can also restore previously archived data at anytime to your main database to view or modify the data if necessary. Calibration As Found and As Left data are collected on the ProCalV5 Calibration Record. ProCalV5 will automatically flag out of tolerance calibrations points as well. ProCalV5 will manage all critical asset data. Such items include, but are not limited to Manufacturer, Model #, Serial #, Responsible Technicians, Associated Vendor details and much more. ProCalV5’s flexibility allows the user to manage not only asset information, but add an unlimited number of additional unique fields to their records, as well as re-label the existing fields to meet their business terminology. Users can manage maintenance and calibration related work items using the ProCalV5 work order and task system. They can quickly assign tasks to technicians and generate work orders accordingly. All record entries and changes generate Audit details that are linked to their unique ID. Audit Trial tools include Server Date/Time Stamp, User ID, Reason for activity and User Authentication through “Double Electronic Signature”. 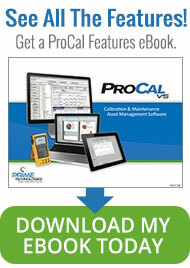 ProCalV5 will automatically calculate calibration and maintenance item due dates according to user defined intervals. Users can set the calibration frequency to any number days, months or years and define how they want the due date calculated. When a passing result is entered, by default the due date will automatically be rolled forward according to the user defined intervals. Calibration data and more may be a critical part to your business application. Because of which, ProCal solutions provide a convenient tool to backup your database and secure your information. The Bar Code Utility allows you to print bar code labels from ProCalV5 that may be affixed to all types of items recognized by ProCalV5. Once labels have been printed, they may also be scanned back into the program making the entry of calibration data or location of records of physical inventory faster and easier. This TTP allows users to certify Bio Safety Cabinets. On the visual prompt provided in ProCalV5, users can record Downflow Velocity, Test Method, HEPA Filter Integrity, Air Flow Smoke and an Acceptance Criteria. Pass/fail is determined by HEPA Integrity Result, Smoke Test Downflow Uniformity, Smoke Test Containment, Smoke Test Opening Containment, Downflow Velocity Average (Standard Test), Back, Middle and Front Velocity Averages (Zoned Test) and Intake Velocity Average. This screen is used to add, display, modify and if necessary, delete the results of an instrument, loop, test instrument or system calibration. This record is used to capture all information related to the calibration of an item, including inputs, readings, standards used, SOP used, man hours, who calibrated the item, and possibly, electronic approval signatures. Don’t confuse your technicians and staff by making changes directly to your production records before modifications are approved. Make changes instead by using the Change Control feature and circulate the changes for approval electronically without disrupting operations by disturbing the current approved version. Test Type Package designed to test the accuracy of the timing functionality of a chart recorder. Compliance reports are a tool that can be used to keep track of calibration events that relate to compliance. You can set the system to auto-generate a report, or the user can create a report when any non-conformant or non-compliant event occurs. The Configuration Manager allows you to quickly view all of the current company’s records, as well as their relationships to one another. Avoid the time consuming delays and the uncertainties of distributing documents for review and approval signatures. ProCalV5 Users can define their own approval policies and apply them as desired to Item Master Records, Calibration Records and Compliance Reports. An unlimited number of required signatures can be defined, with each one associated with a configurable set of User Groups. Signatories can be configured to be notified simultaneously or in a fixed sequence. The Reminders system acts as a routing method for approval fields that require review and signing by responsible users. This feature allows users to create drop down lists for many standard fields and user defined fields. It ensures standardization of choices in your drop down menu’s. ProCalV5 enables you to add an unlimited amount of user defined variables (or new fields) to the program. In addition, you may specify what kind of data your users must enter into the new fields. All user defined variables added to the system will become a part of the User Defined tab on the screen in which they are located. ProCal systems enable rapid data entry even easier. Users can create an asset record, or even a template, and simply “copy” that record to apply the specifications and much more to a new asset record saving time and money associated with data entry of asset records. Reports generated by Crystal Reports can be exported to user selected disk destination files in various formats such as PDF, RTF or HTML. Users may also export the results of Advanced Queries to text or Excel® file formats. DataExchange is the premier utility from Prime Technologies to facilitate a standard interface between the ProCalV5 database and your outside systems (e.g. ERP, CMMS, LIMS). DataExchange’s architecture is based on a series of database tables, triggers and views that reside in a schema outside of the ProCalV5 production database schema. Users can choose how dates and decimal numbers are displayed in the program. They may select all numeric date formats (5/31/2006), or alpha and numeric date formats (31-May-2006). ProCalV5 allows Users to set system wide defaults, as well as defaults for individual companies. These defaults will be displayed in record types throughout the program and can be used as is, or changed at the time of data entry as needed. The Dissolution – Chemistry provides for Tablet Calibration test portion of Dissolution Bath calibrations. This TTP results in the eventual comparison of a “% Dissolved” value for each vessel, compared to the minimum and maximum % Dissolved based on a USP Lot number. The Dissolution – Temperature allows the user to capture a given number of temperature test points, each one representing a vessel in a Dissolution Bath, or an External Bath, or some Other Probe related to the test. The Dissolution – Wobble Test Type Package allows the user to capture the Apparatus used when performing Dissolution Wobble tests of several vessels of a Dissolution Bath. The Divisions Verification Test Type Package interpolates intermediary values of the output signal type between test readings, based on the difference of those test readings divided by the difference in the input set points. Calibration related documents such as SOP’s, Manufacturer Specifications, and other procedures related to your calibrations are managed through the use of the document manager. Users can approve and view documents, schedule review frequency, and copy and paste procedures directly into the document manager. You may also link disk or web-based files to the document record. ProCalV5 features advanced functionality to help users comply with FDA guidelines for 21 CFR Part 11 compliance. When this feature is enabled, all changes will require the entry of a valid User ID & Password, as well as reason for modification for each time a change has been made. ProCalV5 Users may make use of configurable sets of approval policies or built-in signature fields. The ProCalV5 Reminder Email Utility, automates the process of getting Reminder/Notification content to ProCalV5 users. Every user whose employee record has been completed with an email address can be set up to receive a copy of the Reminders screen as it would appear to them if they logged onto the main program. Allows users to be defined by name, Employee numbers, User ID’s, Password Management, Contact information as well as the User Group(s) they are associated with. The equipment master records are used to track items that are not calibrated in the system. Users can schedule planned maintenance items on equipment. Users can also associate instruments and loops as components of equipment records. For example, a chamber could have multiple humidity and temperature sensors connected to it. The event history is a searchable audit trail. It allows users to quickly and easily find any historical events that are associated with their items. For example, users can use this feature to determine when calibration for an instrument, as well as when status changes occur. This feature of ProCal allows users at anytime to view any asset history in a specified date range for such items including, but not limited to Calibrations, Location changes, Status updates and more. This tool provides a very convenient way of managing audits as well. All data pulled from this tool may be printed as well. With the use of ProCalV5’s Field Calibrator Utility, users are able to download calibration assignments & specifications directly to a documenting process calibrator Technicians may then go into the field and complete the calibration assignment in accordance with the predefined and approved procedure. The completed calibrations are then easily and seamlessly uploaded as electronic calibration records to the ProCalV5 system database. This Test Type Package allows users to certify fume hoods. User set the Output Resolution and the Acceptable Low & High Values. Also, a user can set the # of Columns, # of Rows, Sash Opening and Sash Width. During a calibration is where the Average Velocity, Hood Opening, and Air Volume are calculated and the Pass/Fail is based upon the average velocity compared to a user established acceptable specified range. The ProCalV5 Gage R&R Utility allows users to collect data for a Gage Repeatability and Reproducibility study on individual items they are managing and report on range of operators, acceptability and more. This powerful Test Type Package will allow users to perform glove box certifications. Box Height and Sash Width for the glove box are managed in ProCalV5 and assigned by asset. The visual prompt for performing calibrations allows users to perform a calibration/certification to their Glove Box. This powerful feature provides an economical alternative to the high priced hand held communicators that are available today. Users can make full use of their laptops with these tool either through a USB Modem or Wireless Modem to communicate and configure HART devices. Our program contains a dynamic help system that can be accessed from any point in the program. The Help System includes an index on topics as well as a search option. The HEPA Filter Integrity Test Type Package will summarize the results for HEPA Filter Integrity tests (in VLF mode) and apply a pass/fail to the data. The test will calculate the Average Face Velocity = Mean of all the entered Velocity Data entered in any preceding test point groups that use the “VLF” “Test Type” input value and determine pass/fail based on the Low Velocity & High Velocity calibration points. The Extreme Values Test Type Package accepts a set of test point inputs and calculates the minimum or maximum reading from the set from the results of the HPLC Detector. The ProCalV5 Import / Export Utility allows users to use mobile workstations with their ProCalV5 Quality Management Software. With this utility, you have the ability to move data between your production (main) database and a mobile database on another machine, for example, a laptop. After completing the desired work in the mobile environment the new calibrations and instrument modifications can be imported back into the production database. This Test Type Package will allow users to display the As Found and As Left readings back in the unit of the Input Signal Type in ProCalV5. This test defaults to a linear correlation from Input Range to Output Range unless the Correlation to Output is specifically set to Square Root by a user. The Item Comparison screen allows you to take a list of items (instruments, loops, equipment, test instruments and/or systems) and determine which ones have field values that do not match one another. If the User has the ProCalV5’s Bar Coding Utility, they may find this functionality particularly useful for performing an inventory targeting items that do not belong in a particular location or on a specific piece of equipment or system. ProCalV5 allows various item types, including instruments, loops, systems, test instruments and equipment. This standard feature in ProCalV5 enables users to effectively and easily manage items they want to manage. By using this feature, ProCalV5 allows anyone to utilize their business terminology. Additionally, this feature can allow non-English speaking users to input various other languages in those fields, for example Spanish. All labels that are changes will also update on reports associated with those labels for consistency. The Laminar HEPA Filter Test Type Package calculates the Average Flow and a limit based on that Average Flow across a HEPA Filter from a set of flow measurements. ProCalV5 allows any user to establish linked files to any other file type outside of the ProCalV5 system. Users need only be able to open the file type, and ProCalV5 will automatically launch it no matter its file type. Such items may include PDF files, Excel spreadsheets, Word documents, Text Files, a website or any other application. The Manual Pass/Fail Test Type Package allows the user to identify the test using the Group Name field, and enter whether or not it passed or failed. The ProCalV5 Mass Update Utility, allows you to perform one or more updates to multiple records at the same time. One approved Mass Update record can be stored as a history record for a mass modification. Each Mass Update record, as well as each target record updated, can have a complete audit trail of modifications made. Mobile Workstations allow technicians to import and export data on to a mobile device, such as a laptop PC. This allows technicians to enter calibration data with full ProCalV5 functionality, in real time, as the calibration event is performed, without having to be connected to the Production Database. After calibrations are completed, they are securely imported back into the Production Database for review and approval. Test Type Packages for two tests designed at two different temperatures for a time period. ProCalV5 supports six languages. User defaults can be set at system, company (account) or individual user level. Changing to another language is via a simple drop-down selection. This powerful calibration feature for ProCalV5 allows users to enter calibration data for multiple assets easily. The multiple readings test will allow users to enter multiple As Found and As Left readings for a single input reading. The user can predefine a set of Heading Labels and Units for up to 5 additional As Found and As Left columns related to their test points. All values are captured on the Calibration record. The “My Notifications” section of the Reminders screen contains all notifications that have been routed or sent to you as a member of a User Group. This feature can be configured to send Notifications for failed calibrations and when Change Control Approval signatures are required for master record modifications. Using the ProCalV5 Mobile Workstation or a device that is connected to your network, technicians can directly enter data into the database as it is generated. This eliminates the need for paper worksheets, eliminating the potential for illegible documentation in the future. Required signatures now handled by lines on handwritten worksheets can be performed electronically in a 21 CFR Part 11 compliant manner. Paperless Technology can be extended to Compliance Reports generated as a result of Failed or Late Calibration event and to electronic record Change Control and applied Approval Policies. Thus creating a Paperless Metrology Environment. The PE 900 Series Interface Test Type Package captures three values for each of two Channels (A and B): Percent Gain, SD Gain Error and Linearity Error according to a +/- deviation from zero Tolerance specification. This allows users to capture multiple repeated volumes and weights per each Pipette test volume. Each set of readings is tested for precision (%RSD) and Accuracy (% of target volume). This test type allows users to capture multiple repeated weights per each Pipette test volume, and convert to the corresponding volume according to an entered temperature value. This is done using a water density factor table. Conversion from milliliter and micro liter to milligrams or grams is done automatically. Each set of readings is tested for precision (%RSD) and Accuracy (% of target volume). ProCalV5 allows you to create planned maintenance (PM) records that may be assigned to work orders or used independently of the work order system. Each scheduled PM event may be configured as a maintenance item or as a secondary set of calibration specifications for a given item. This feature of ProCal allows users to view their data in a “Windows Explorer” type format. Filters include such things as an Item Type List, Monthly Schedules, Department Listings and much more. ProCalV5 comes equipped with a reminder system, whereby overdue calibrations, work items and alerts will appear on the Reminders screen. There are many different types of reminders that may be configured by User Group to appear in this screen ranging from Late Calibrations to Un-finalized Maintenance Results. The Reminders screen may also inform users of their current Review and/or Approval obligations. The Reproducibility Test Type Package calculates the Standard Deviation and Reproducibility value for the given test group, for a variable number of readings, a standard value, and a maximum Reproducibility value. It then compares the Reproducibility to the maximum Reproducibility value to determine the Pass/Fail. ProCalV5 includes a comprehensive selection of over 70 Standard Reports and Forms. Our Customer Service Specialists routinely create custom reports to User specific specifications. Users with Seagate Crystal Report experience may easily modify the standard reports or create their own. A convenient Report Management Utility allows the addition and re-indexing of the new report document templates. Unique worksheets, calibration reports or other custom documents may be assigned for different accounts or instrument requirements. ProCalV5 allows users to establish by record type certain fields that are “required” to be addressed on that record by a user entering data. This functionality allows users to reverse trace a standard that has been previously used to calibrate a particular instrument, loop, test instrument, or system. Through the reporting system in ProCalV5, reports can be generated on reverse traceability. Temperature-to-Ohms conversion in Celsius and Fahrenheit, lookup or interpolate Inputs from Outputs or Outputs from Inputs, from Temperature to Ohms and Ohms to Temperature. This powerful Test Type Package provides calculation of scales & balance calibrations for multiple tests including Zero tests, Corner Tests & Repeatability tests. Access and Security are managed through the establishment of User Groups. This password-protected system can also be enhanced with add-on authentication methods to utilize external systems such as LDAP or Active Directory servers. User access can be defined by the company, screen and access rights within that screen. Password expiration requirements can be enforced to keep your confidential data secure. With ProCalV5, you can easily manage an unlimited number of sites or accounts in your system. Centrally install and deploy at your convenience to manage additional sites or accounts. By easily configuring the system, you may define user rights and privileges throughout the entire system to control what each user can and cannot do throughout each site or account you wish to manage. The ProCalV5 Shop Administrator Utility links together ProCalV5 and QuickBooks®, greatly simplifying calibration service Account Management & Invoicing. ProCal systems allow end users to personalize their workstation even further by providing a selection of “skins” for their view of their application. This Test Type Package will perform Pass/Fail on a Velocity Reading and a Time reading, in fractional Minutes. It will also give a Replace Battery warning when the Average Voltage of a set of test point readings is outside of a given acceptable range. The Stopwatch Test Test Type Package calculates the Deviation, % Deviation and % Error for a Stopwatch based on a specified standard frequency and a reading of a measured frequency. The Switch Test allows the user to capture either a single point trip test or a two-point trip and reset test. Many of the features of ProCalV5’s standard calibration are used, such as the variety of limit calculations and providing the ramp range. A special feature of this Test Type package is the ability to download this test to a Field Calibrator using the ProCalV5 Field Calibrator Utility FCINTF interface. The Tablet Press calculates a Tab / Hr * 1000 value for a number Tablet Press stations and compares it to the indicated Tab / Hr * 1000 value. This Test Type Package will supply and record a list of tasks for maintenance or calibration-related maintenance steps to be recorded on a Calibration record. Template Group Load Test Type Package will allow users to load a test point group from a different item dynamically during calibration entry. This allows certain items to be used as “templates” for groups in another item. Optionally, only a certain number of points will be taken from the requested item/test point group as well. The Test Omission Test Type Package allows the user to omit particular test group(s) from the overall determination of Calibration Pass/Fail. Test instrumentation and standards can be managed in ProCalV5 along with their test specifications for metrology calibration tracking. Standards can be qualified for a particular set of instrument types to filter the user’s list of available standards, preventing possible errors in data entry of calibration results and ensuring that all calibrations are traceable to the standards used. ProCalV5’s unique “Test Type Package” (TTP) functionality enables users to perform calibration procedures involving complex algorithms and obtain automatic Pass/Fail Results. You need only define the test requirements and procedure and Prime Technologies engineers will develop a “Test Type Package” solution to suit your requirements. Prime Technologies maintains a library of existing TTP’s for use in new situations to solve your requirements. Examples include Uncertainty, Repeatability, Linearity, Extreme Values, HPLC calibrations and Laminar HEPA Filter Air Velocity tests. For users who have sites in multiple time zones, the time zone setting allows users to affix a specified time zone abbreviation on each time stamp on ProCalV5 Oracle platform systems. All time stamp data is displayed relative to each user’s local time zone. The Training Workbook is provided and used during your organizations training classes to assist the end users and management in learning and configuring the new system. The ProCalV5 Training Module allows you to log and track your employees’ training, as well as various courses and classes. Since the Training Module works off the same database as your main ProCalV5 software, all user group and employee records already established in your production database are easily accessible directly from the Training module. In addition, both your main program and the module may run at the same time on your workstation. Users can use the trending reports in ProCalV5 to identify trends by tracking calibrations over time. This feature uses Test Type Package (TTP) functionality to perform an Uncertainty Budget Calculation when an item is calibrated if the User has assigned the appropriate standards. The TTP calculates an Expanded Uncertainty value for a given unit, Coverage Factor (k) and desired number of significant figures. For scheduling calibrations, users may establish different usage counts to determine when equipment should be due for calibration. Counts can be defined to be updated by a meter or incremental method with a maximum usage. ProCalV5 captures the users that enter count updates as well as keep complete count histories and the associated count based scheduled information including current usage and target percent. User administration is made easy in ProCalV5 and an administrator may view who is logged into the system at anytime, view employee records, activation dates, force log off selected users and more. Allows administrators to apply a specific set of rights to a group of Users in the system. The groups allow administrators to pre-define rights for different types of users and assign new users to those groups. This powerful feature is used in conjunction with the ProCal Advanced Query Utility. Users may define any search, sort or filter in ProCal and assign a wildcard to match similarities of a search for data for even easier querying. ProCalV5 allows you to group work items such as full calibrations, PM items and maintenance requests by assigning them to work orders. Work order records may then be tracked throughout the system as their tasks are completed. Prime Technologies can provide the test scripts and specific guidelines to prove the effective functional use of ProCalV5, as well as assist organizations in validating our software application. The IQ, OQ, PQ and any additional forms included enable our end users to record all the pertinent data required to demonstrate that the ProCalV5 calibration software works appropriately. ProCalV5 solutions enable users to manage vendors associated with your assets who sell or service anything for your organization. Contact information and vendor lists are all stored in ProCalV5. My company has used ProCal for 5 years and we are truly impressed with the overall ease of use , flexibility, detail and most importantly excellent customer support. Anytime we need assistance or want to customize a report, the team at Prime Tech are always there to take care of us. I would highly recommend the use of this product for the management of any serious calibration program.